About a year ago Pilar, the psychologist I met in Dichato where she is involved in community recovery programs with the most affected of the 2010 tsunami victims, told me “In ten years Dichato will be reinvented, more attractive than ever and with better services for visitors and townspeople alike.” So to coincide with the fourth anniversary of the earthquake, I made a visit to this lovely coastal town in south central Chile, this time with Ximena and my friend Ned, the Director of Harvard’s program in Chile that includes an interesting initiative to help very small businesses in Dichato get back on their feet. 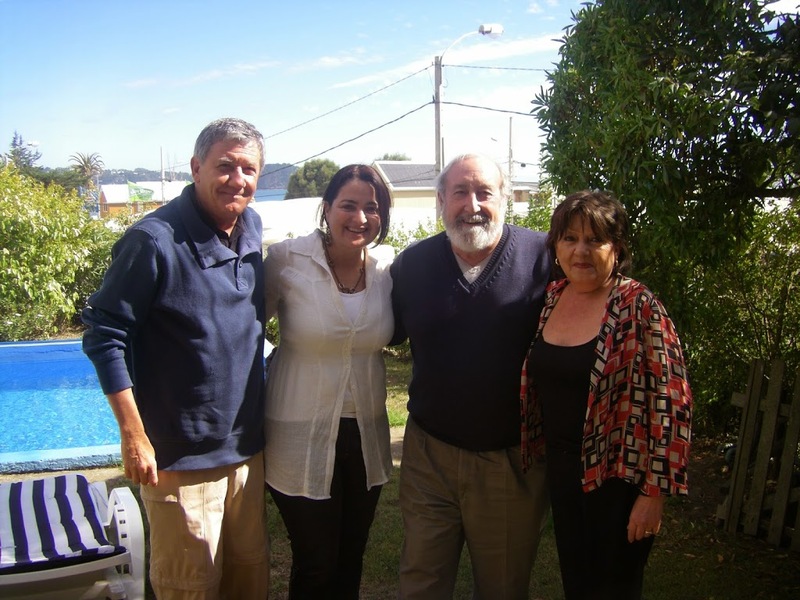 I was looking for some evidence that Pilar’s optimistic prediction might eventually prove true, so we arranged first to spend some time with Martín, our host the last time we were in Dichato, to get his view of Dichato’s recovery. 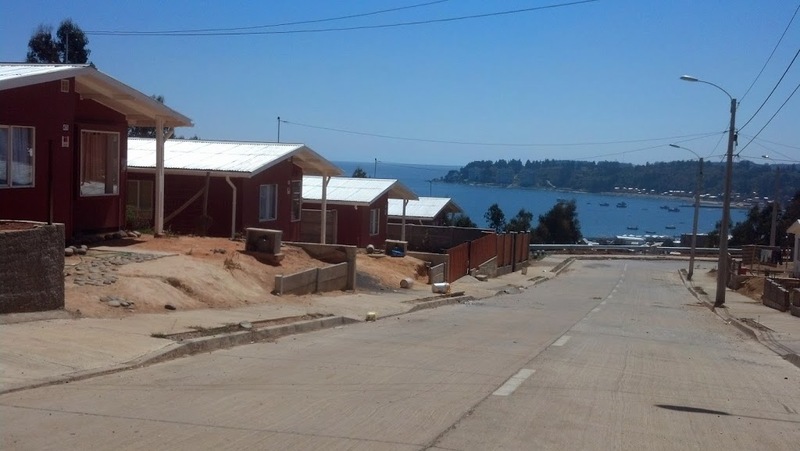 Like so much of this part of Chile that was destroyed by the quake and tsunami in 2010, cursory observation and the statistics produced by the outgoing Piñera government suggest impressive accomplishments in the rebuilding of basic infrastructure. 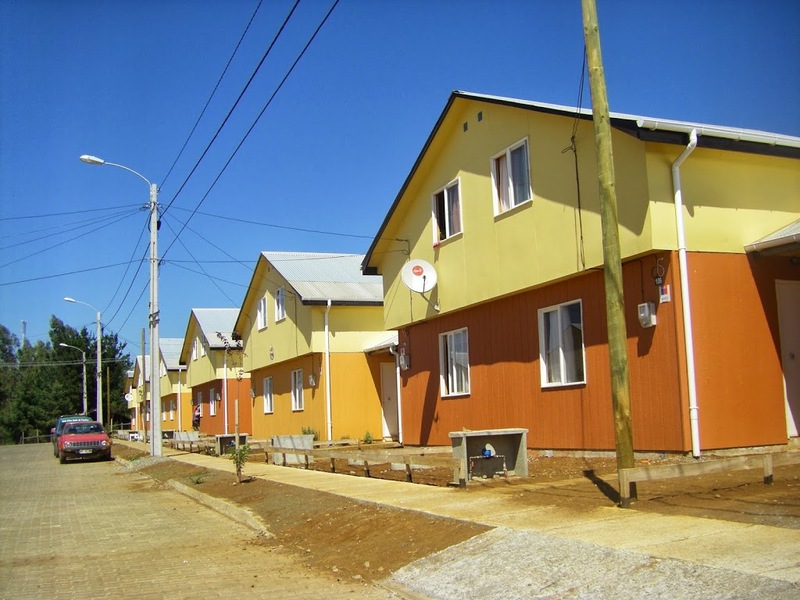 Martín confirmed that new communities of subsidized housing in and around Dichato now accommodate over 90% of those who lost their homes in the disaster. 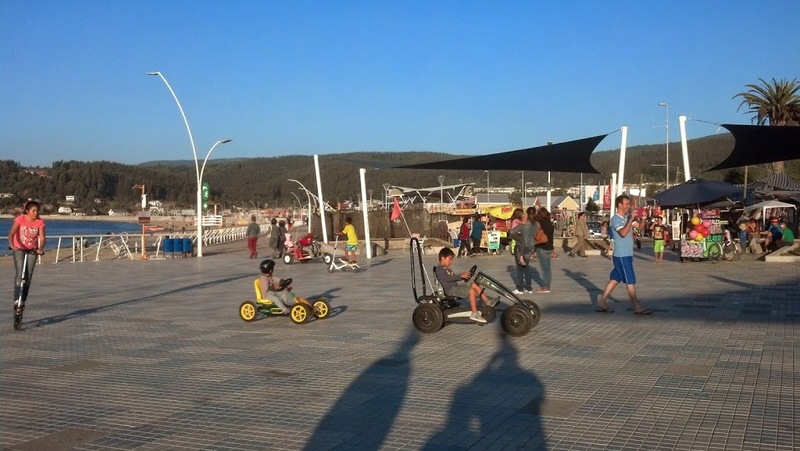 The monumental seawall covered with a very attractive pedestrian walkway we saw being built a year ago along the entire beach area in front of town is almost finished. 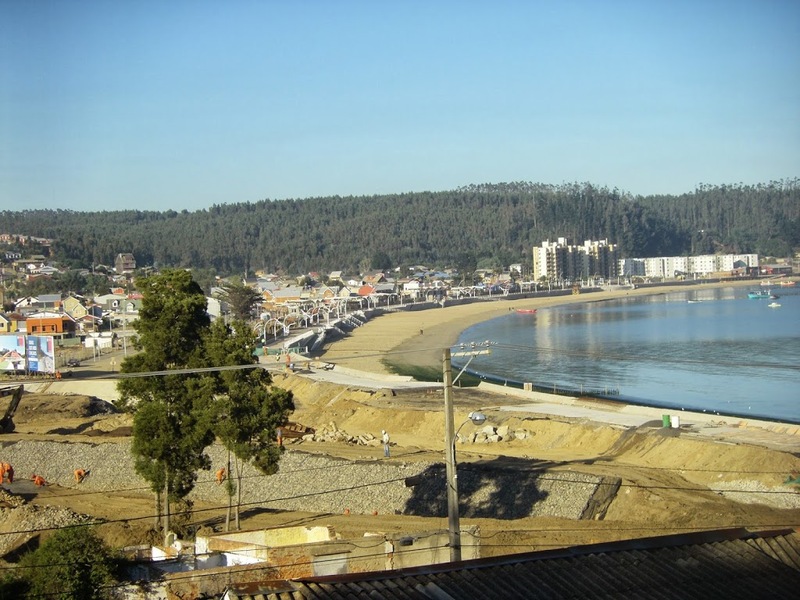 The waterway that winds its way through the north end of town is being fortified and redirected so its outlet is further away from where it originally emptied into the bay too near to the town’s beach, and a new bridge will soon link Dichato with the road north to Pingueral and up the coast. The four-block commercial area hosts new stores of all kinds of services and goods, restaurants have sprung up throughout the town, and the hotel on the main street looks invitingly comfortable. Had this been the case four years ago when I passed through on the evening of February 26 looking, unsuccessfully, for a place to stay, I would surely be telling a different story. All in all, you would have to say Dichato looks pretty good, maybe even vibrant for this time of year. Martín also confirmed what I had thought before the recent presidential election, that Bachelet’s unremarkable leadership of the immediate response to the 2010 earthquake and tsunami, although drawing considerable criticism at the time, did not seem to result in any significant residual electoral damage to her; she and her coalition won pretty broadly in this part of Chile. Even though seven of the main officers in the disaster response organizations working for her at the time are still facing drawn out legal proceedings, some with criminal charges, she has clearly survived this event legally and politically. Four years ago, these seven civil servants and many more of their colleagues were faced with making life or death decisions based on a myriad of data sources from Chilean institutions and from the US on the strength and location of the earthquake, and had to determine whether or not to warn the public of impending tsunamis and to order evacuations of the most vulnerable coastal areas. The disaster response institutions within which they worked were poorly organized and equipped to deal with the enormity of the situation, and possibly worse still, they and their personnel were not well trained to analyze the incoming information and respond appropriately. In spite of decades of prior disasters, including earthquakes, floods, and volcanic eruptions, and professional advice provided over the years from disaster relief specialists such as those working in USAID’s Office of Foreign Disaster Assistance, modernization of Chile’s disaster response mechanisms had been delayed repeatedly by successive governments. So what happened is what had to happen; lives were lost due to slow and incorrect warnings and response was hampered by lack of good communications, data, and means to enter immediately and provide security and relief in the affected areas. Over the past four years the Chilean government has made major efforts to upgrade their disaster response capacity. The Navy’s oceanographic and hydrographic service (SHOA) has made what the director of that institution claims is a “technological leap, tripling the capabilities and drastically shortening data transmission times from their maritime stations”. They report to have spent over two million dollars a year for the past four years on this project, increasing the number of monitoring stations from 17 to 40, decreasing the transmission time of data from one hour to five minutes, and creating a new emergency shelter in the SHOA center where before there was none. In Santiago, the new headquarters for the National Emergency Office of the Interior and Public Security Ministry (ONEMI) are about 75% finished. This is the first step in a multi-year plan to strengthen the national capacity to respond to disasters. The new building, totally antiseismic is being built to withstand an earthquake as large as the largest Chile has experienced, the 9.4 quake centered in Valdivia in 1960; the 2010 one was “only” 8.8! The new ONEMI headquarters boasts a high tech communications tower equivalent to 30 stories high capable of providing communications necessary for response institutions and the media throughout Chile to have valid information on a timely basis in times of disasters. Lack of communications between important officers and institutions, including the president, ONEMI and the military officers in charge of SHOA, was one of the most flagrant weaknesses in the 2010 event. To instill better civil awareness and preparedness, communities throughout the country have been carrying out more disaster drills than before, and tsunami escape route signs have been put up throughout all coastal villages and towns to indicate the quickest way to higher ground. So, as Piñera departs his four year presidency that was dominated by relief and reconstruction after the 2010 earthquake and tsunami (his initial economic program was pretty much derailed as a result), he proudly presents publicly and in his travels throughout the world a series of statistics that to him and his team prove a high level of success to bring Chile back from the devastation caused by this natural event right at the start of his term. 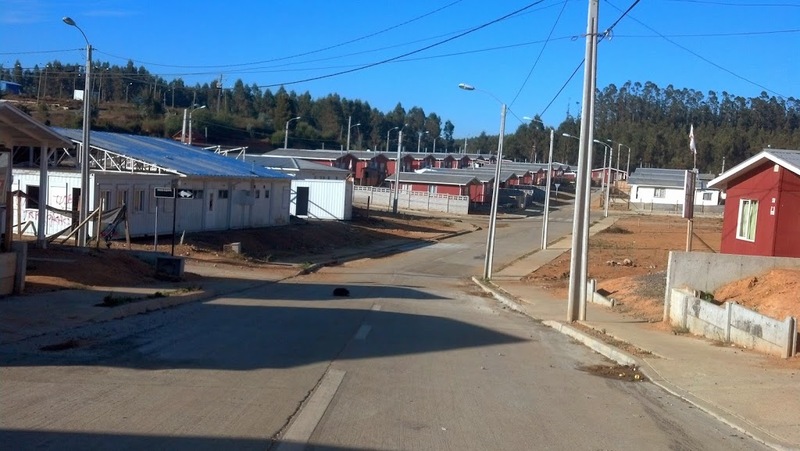 And the numbers bear out his claims: of the 220,000 families left homeless, over 200,000 have been moved from temporary “aldeas” into permanent housing; the number of roads, bridges, schools, and health clinics built in this short period of time is truly impressive. Most fair minded, non-partisan observers will agree the reconstruction effort to rebuild the basic infrastructure destroyed in 2010 has been successful, and in fact, the country is at a point where most people have seemed to move on, and are looking ahead rather than back at the event four years ago. 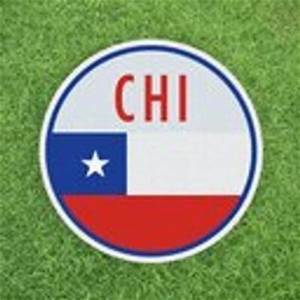 But turnabout is fair play, especially in Chile. Just as Piñera was critical of Bachelet’s performance in the face of the disaster, Bachelet is preparing the grounds to diminish Piñera’s laudatory description of his performance over the past four years. And right she is to do so. She has named a special delegate to review the entire reconstruction effort, and report back to her so she can present the country with her analysis of how successful the rebuilding effort has been, what are the “real” costs to Chile, who profited from the selection of huge construction contracts, who is still waiting for some level of relief, and so on. 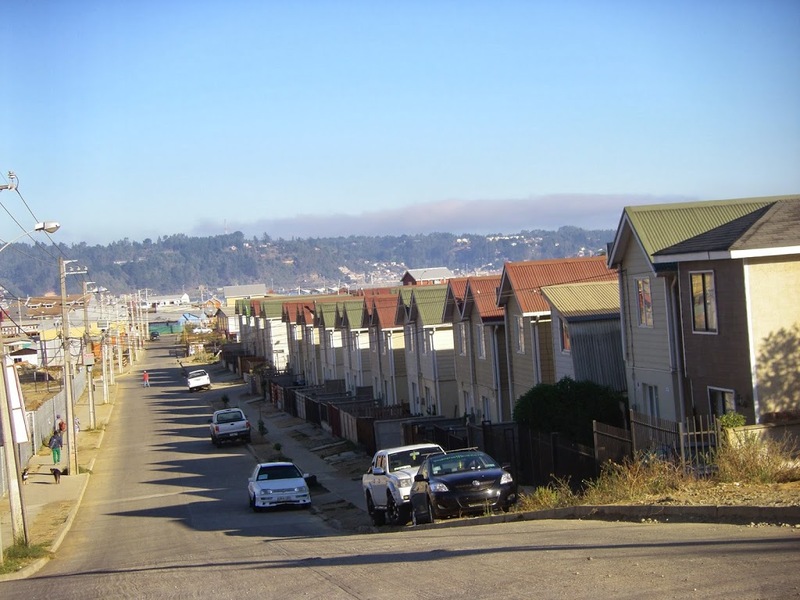 Bachelet has set the tenor for this report by suggesting publicly that “…without doubt the houses and infrastructure are important, but true reconstruction goes much further than the physical works…” done by the Piñera administration. And of course she is right. After all, it was a major disaster. Many individuals, especially children, are experiencing post traumatic syndrome(s) and need therapy on a continual basis. So much more has to be done at the community level where there are still people rebuilding their material and psychological lives. 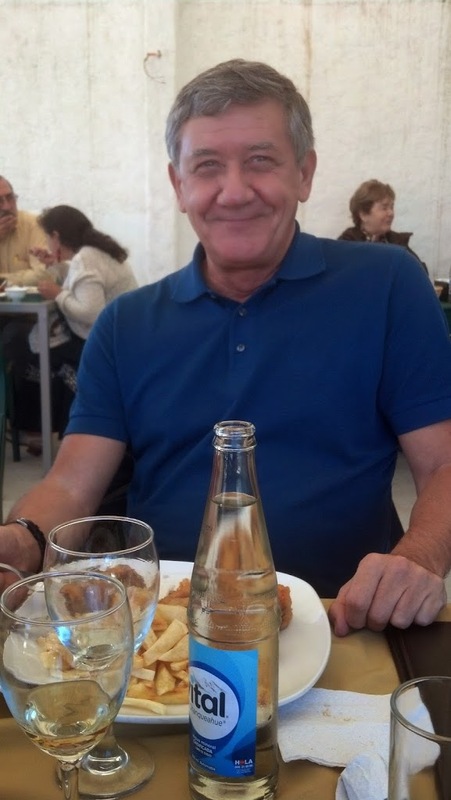 The job is not done, so Piñera’s claim of “Mission Accomplished”, while understandable, leave much unsaid. But much of what Bachelet’s report will say is needed was also needed before the disaster. More and better hospitals, rural roads, churches, libraries, and police and fire fighting facilities are needed almost everywhere, not just because of damage from the earthquake, but also because Chile is still in need of basic socioeconomic development, especially in the regions distant from Santiago like that where Dichato is located, and in areas where poverty is still a daily reality. A good inventory of these needs is a great place for Bachelet to start if she really plans to bring more geographical and economic class balance to the distribution of investment of public resources. And what her report will most likely (hopefully) state is that the social fabric, the tejido social, of towns and villages, so key to prepare for, survive, and recover from natural disasters, and for the country to grow and develop in a more balanced way, is still sorely lacking since being essentially destroyed in the 1970s. This is the dimension of the reconstruction program that has been missing over the past four years, and without a doubt Bachelet’s interlocutors will find overwhelming sentiment that social organization and more serious local participation in all levels of decision making needs her attention. This of course she already knows; she has shown that she feels deeply about the need for this, and in fact ran her successful campaign on this issue. What’s not so obvious is whether she and her new team know how to address these needs in a sustainable way without dictating approaches and centralizing programs. 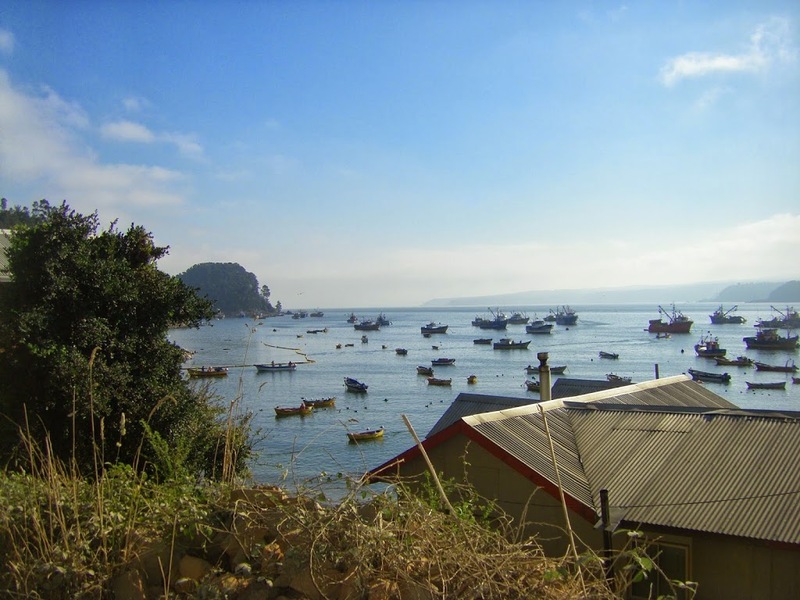 Every year since the tsunami, Dichato has hosted a big music festival “Viva Dichato” an event meant to attract visitors who might spend a few days and plenty of pesos supporting the businesses that have been reopened and new ones that have moved into town. 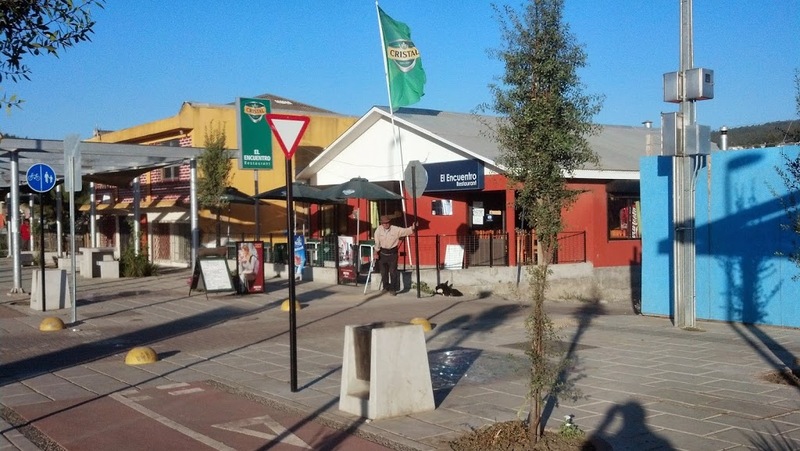 This multi-day celebration, staged on the new walkway next to the beach and televised throughout Chile, besides bringing visitors and their money into the Dichato economy, has enlivened this town and her people who were so depressed by the terrible events now just four years ago; it has become very important to the town. 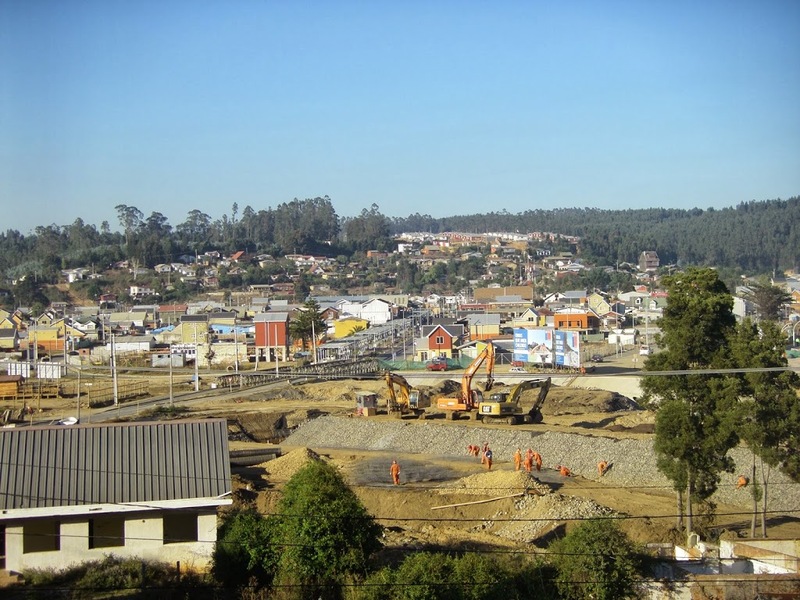 But, now that the houses and buildings are almost all built, the roads and bridges almost all repaired, the street lights installed, and the “Viva Dichato” entertainers have moved on to the next concert venue, the really difficult job of community organization and sustainable business development begs attention, or what appears to be progress will be fleeting. 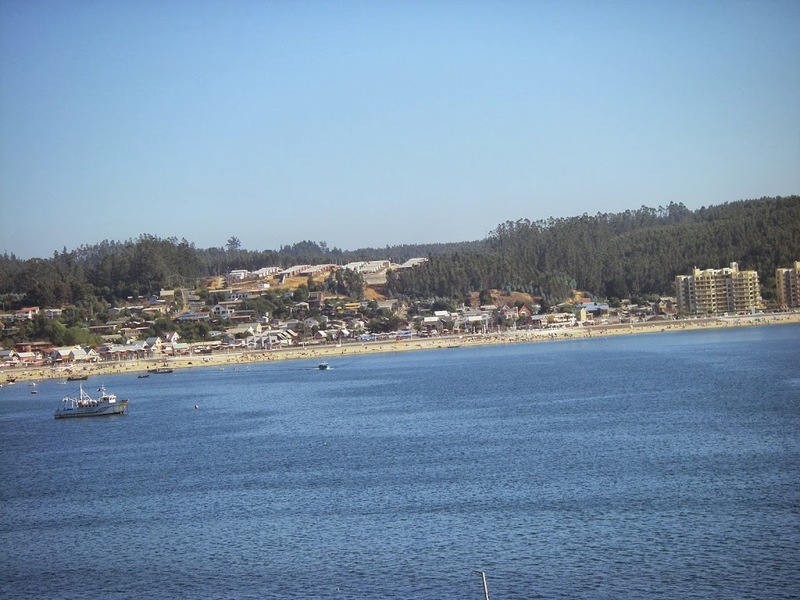 Dichato is a vacation town, for the most part dependent upon seasonal tourism limited to a three to four month period in the summer when the population of the town grows from the normal level of 4,000 residents to around 12,000. Businesses have to make most of their income during that period. 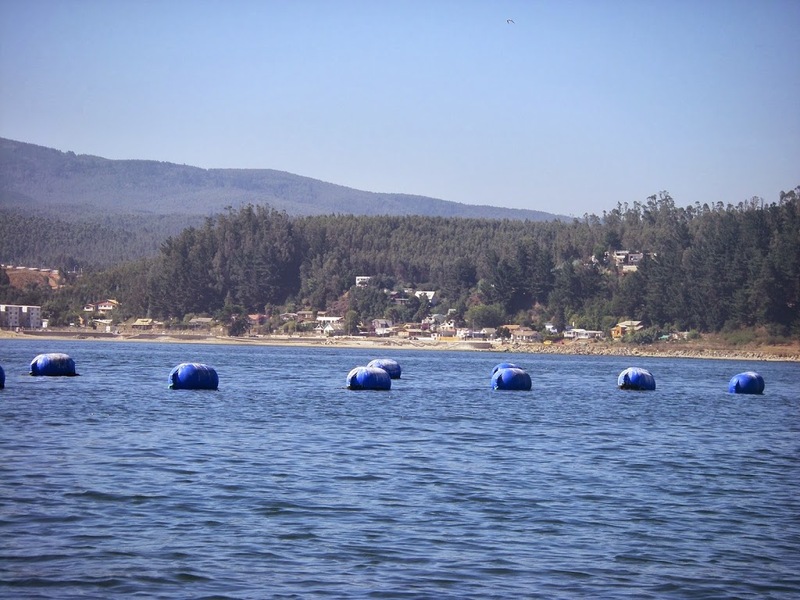 Some close the remainder of the year, while a few stay open all year long at a much reduced level of activity to serve the full time residents and what few tourists do come to Dichato in the off season mostly on long weekends. 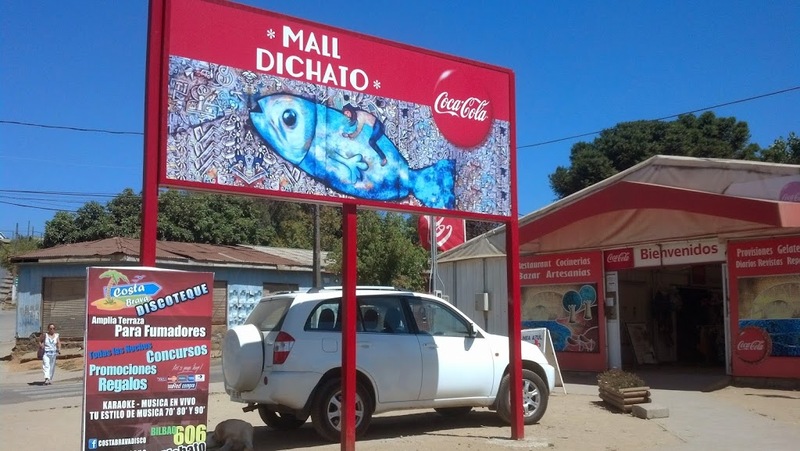 Over time, it seems to me, Dichato must attract more off-season visitors, and to do so they have to provide a higher level of service (restaurants, hotels, activities) than they have in the past. They have to develop new and higher quality employment and income generating businesses. 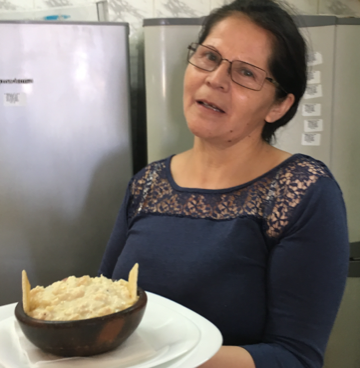 In the first year after the disaster, a Harvard program called “RecuperaChile” made small amounts of money available to individuals and very small businesses, like the woman who runs the newspaper and magazine kiosk on the main corner of town (her kiosk was completely washed away in the tsunami, so she received enough from the program to get a new one and open up very soon after the disaster) and another who is now renting kayaks on the beach, an activity that could be lucrative throughout the year, not just in the summer, given Dichato’s relatively benign climate. Both seem to be doing well after about three years of operation, and that’s a good sign. 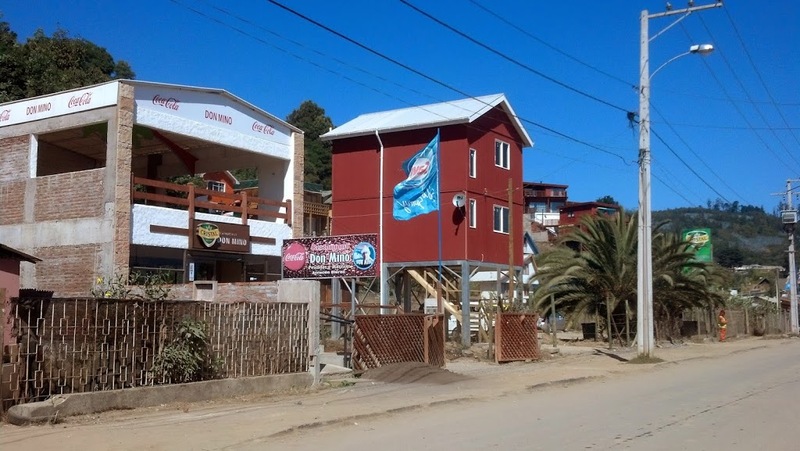 And of course we checked in on Don Mino, who runs the seafood restaurant he rebuilt after the tsunami just north of town in Caleta Villarrica with assistance from CORFO, the government development corporation. Mino is clearly thriving in part because he serves the best fried merluza(hake) in town. 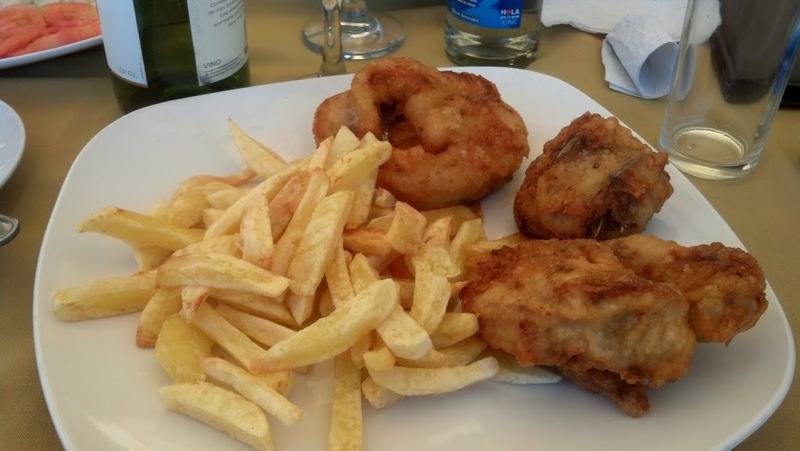 Here’s a tip if you visit Don Mino’s place: he also will make available some local pipeño, the fresh homemade wine produced in the Maule and Bío Bío regions from traditional grapes like País, which is making a comeback after years of relegation to the backrooms of rural pubs and rustic eateries called picadas. To get a bottle of this, though, on the day we were there, we had to order “Sta. Emiliana” with a wink of the eye to Don Mino, and he delivered it to our table in a refilled bottle with a napkin stopper rather than a cork. Other days I suppose it may have another “label”. 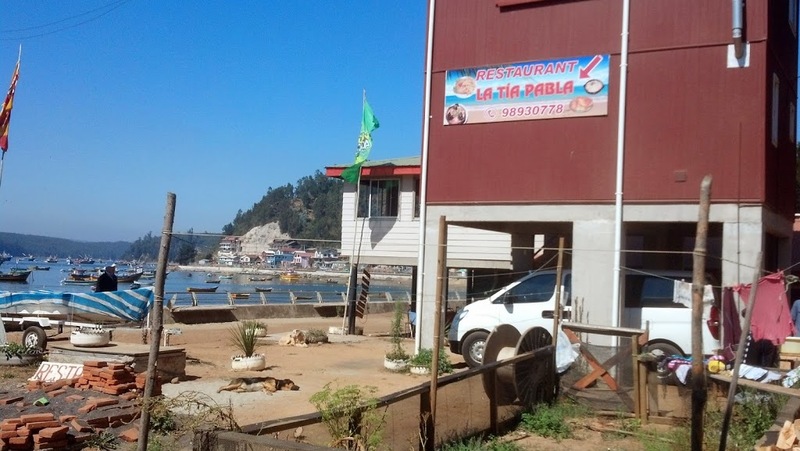 The first restaurant to open after the tsunami, Donde Eduardo, was closed when we tried to have dinner there on this visit, but it looks like he, too, is doing well. 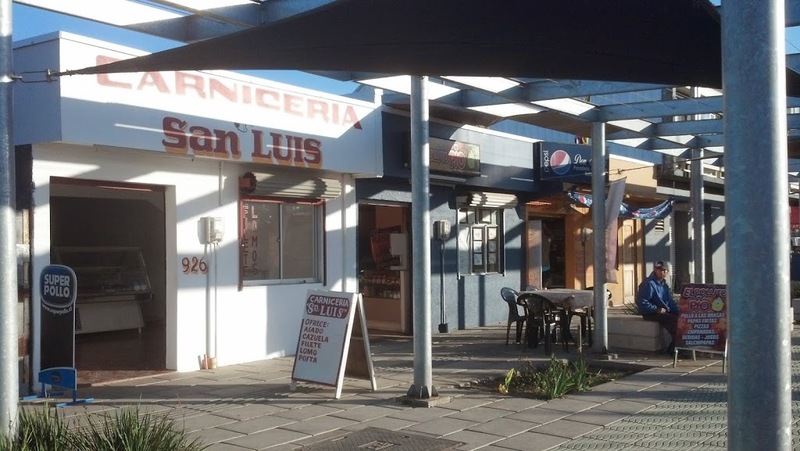 These two restaurants, and probably a couple of others in the center of town that we have not visited, represent the type of eating facility Dichato needs to attract more visitors throughout the year from the surrounding cities of Chillán, Concepción, and Tomé. 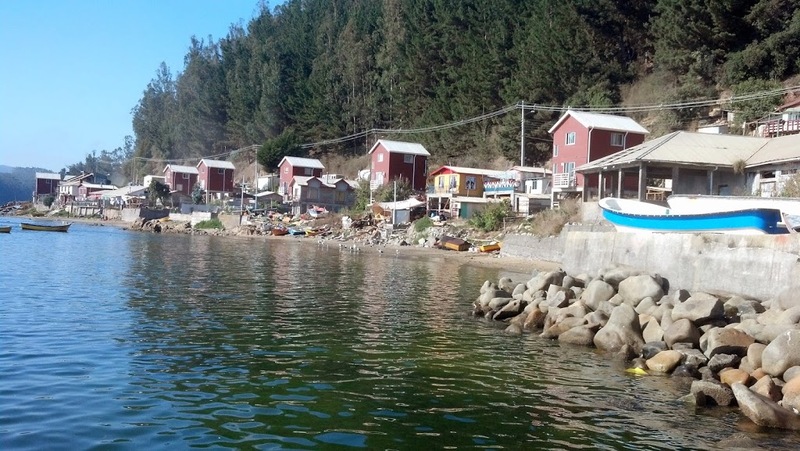 Programs like Harvard’s “RecuperaChile”, because of the involvement of academics who have specific research objectives driving their interest to work in Chile, have the inherent potential to draw attention to opportunities for individual and community development in places like Dichato where so many economic activities were brought to a screeching halt only four years ago. The experts and energetic students who participate in the program, alongside colleagues from the University of Concepción and local authorities, bring “new eyes” and fresh perspectives to the local problem-solving dynamic, and can inject new levels of commitment to old ideas yet untried but with potential. When I try to imagine Pilar’s “renovated Dichato”, I am tempted to see a small coastal town like several I visited recently in Crete. 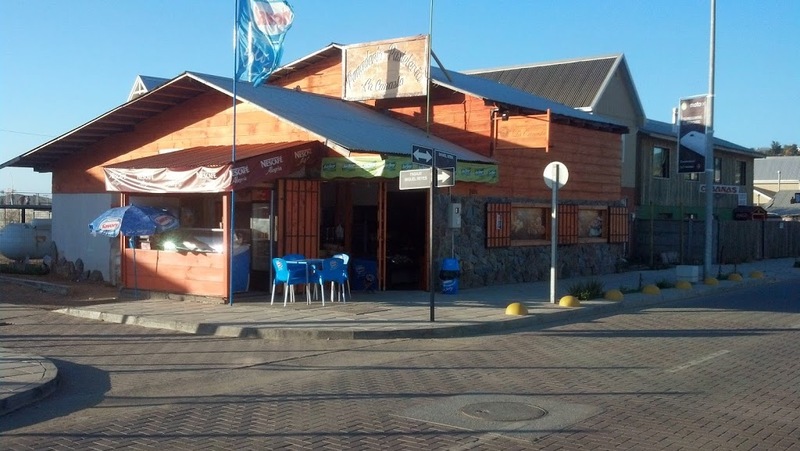 This image would have Dichato offering several very nicely decorated restaurants along the water’s edge; Don Mino’s and Donde Eduardo’s with one or more additional stars, and several new, small eateries operating out of the eye-catching “palafito” houses built with government subsidies in the neighboring harbors of Villarrica and Coliumo. 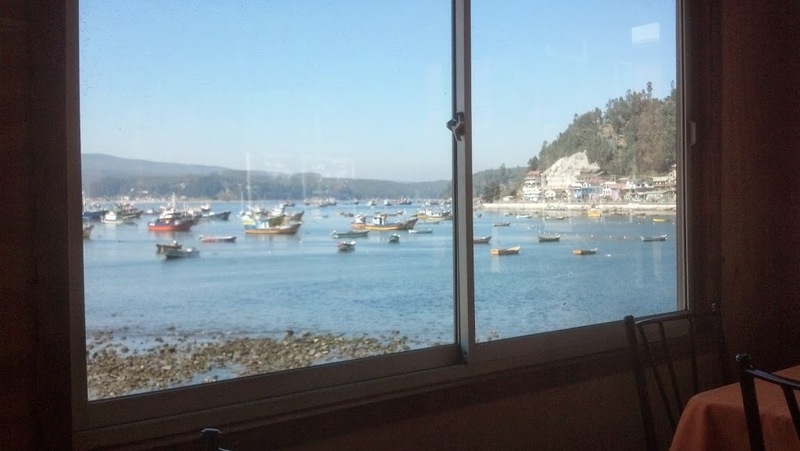 And in town, there would be several places where the menu would also feature seafood so abundant (at times) along this part of the coast of Chile. My image has people flooding into this “renovated” Dichato during the summer and on weekends throughout the year because of these restaurants and the top notch service, high quality food, and unparalleled beauty of the bay. Jobs in these restaurants would require a certain level of training and would pay quite well. 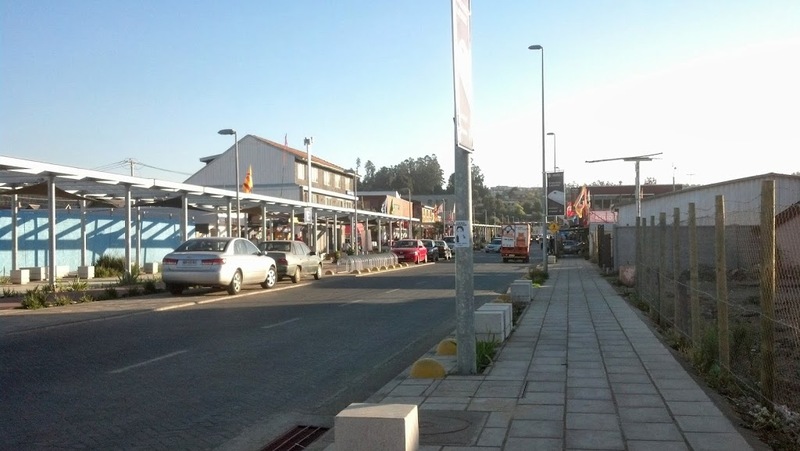 Sanitation would be a major focus of the authorities, not only in the restaurants, but also throughout the town generally. So what would it take for this to happen? In my scenario, it takes a Jessica! And lots of mussels! And maybe some oysters and scallops! 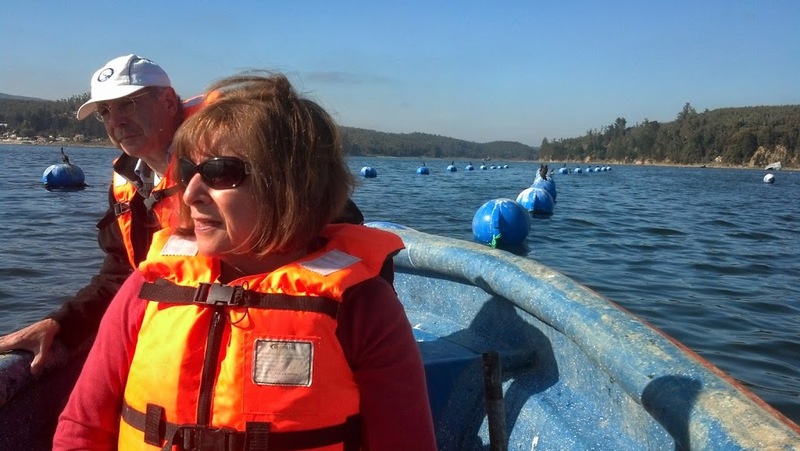 For our visit to Dichato, Pilar arranged for us to meet with Jessica Cabrera, resident of Coliumo, fisherwoman, shellfish diver, and the type of person who, immediately upon meeting, exudes “game changing” personalities. 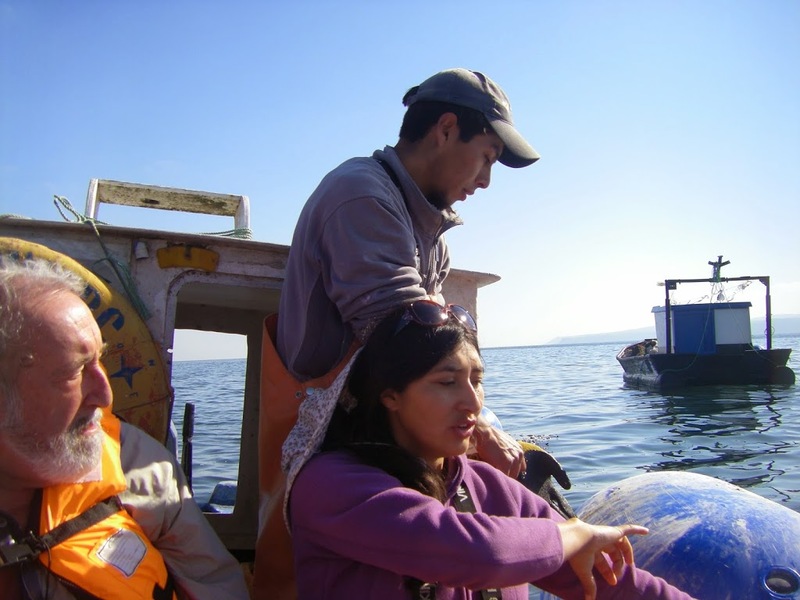 Jessica is not just someone who fishes; she has become a self-taught mariculture expert and producer, having studied industrial scallop, mussel and oyster farming in southern and northern Chile, and courses at the University of Concepción. She is a tough nut, and having struggled with the maritime bureaucracy for ten years to obtain a mariculture concession in her bay, is now the proud but frustrated owner of an 11-hectare section of Coliumo Bay where she began farming mussels only to have the whole operation washed away in the 2010 tsunami, before she was able to have her first harvest. 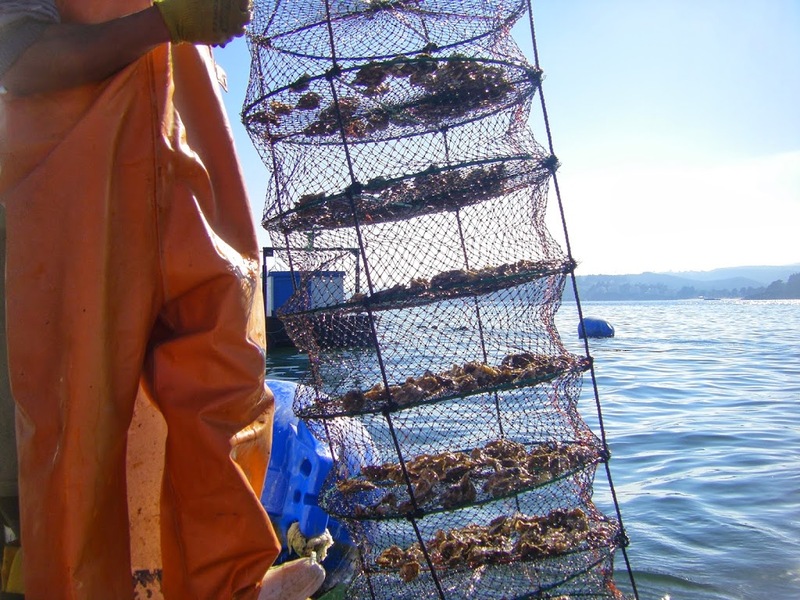 She took us out in her boat with her brother at the helm, and showed us the two long lines of mussels she is now managing, as well as a few wire cages called “lanterns” hanging from the lines with young oysters. 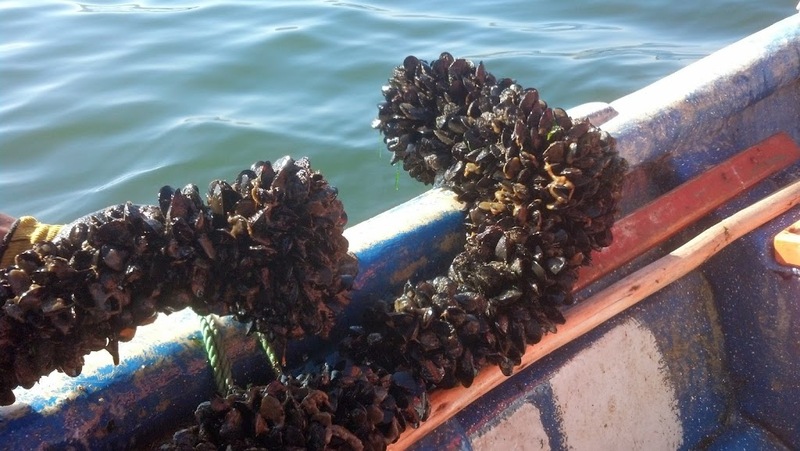 Oyster seeds come from southern and northern Chile, but the mussels spawn locally. 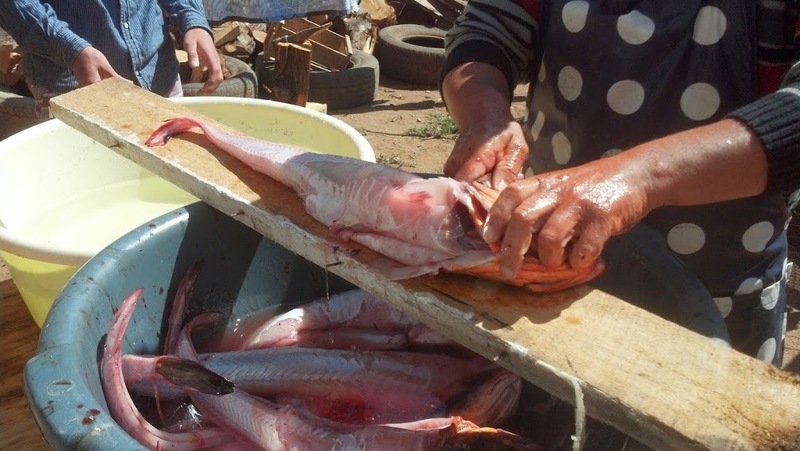 If she grows scallops, that seed will have to come from northern Chile, probably Tongoy near Coquimbo or further north in Bahia Inglesa, near Copiapó. 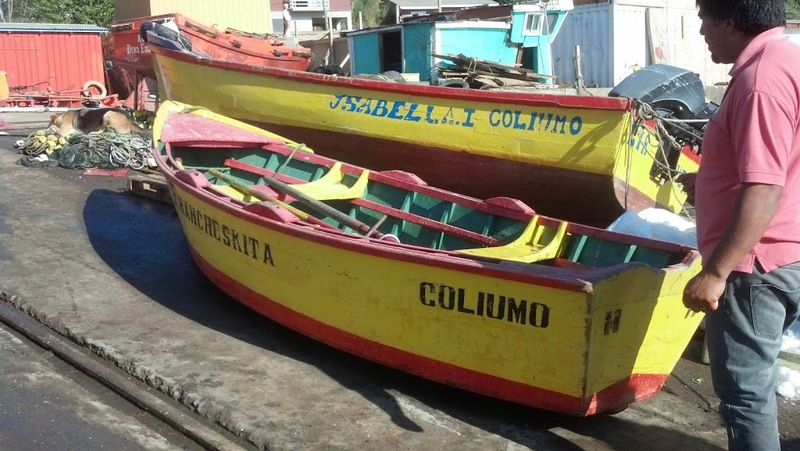 But Jessica is facing huge challenges, not least of which is jealousy and maybe some sabotage from her neighbors and fellow fishermen. Jessica would like to have her entire concession filled with mariculture long-lines, but to do so she needs to associate with other fishermen, which she claims should be possible right now since so many fishermen are out of business because of the scarcity of wild fish and associated restrictions to their habitual fishing. 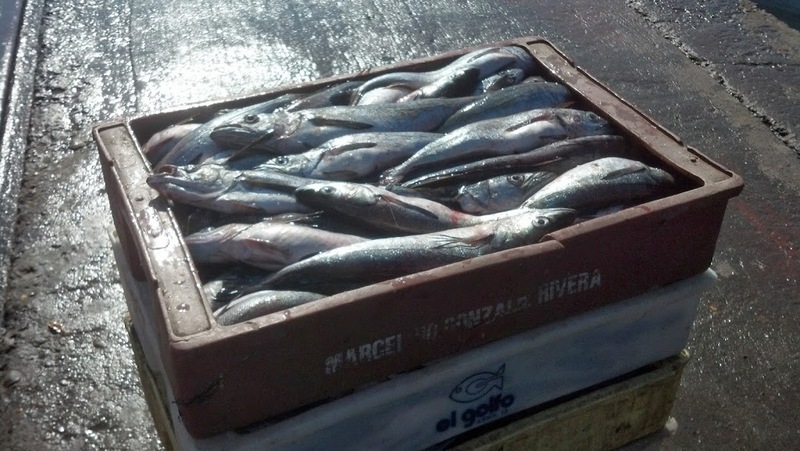 But fishermen are notoriously untrusting, competitive, and tend not to join commercial cooperative arrangements. 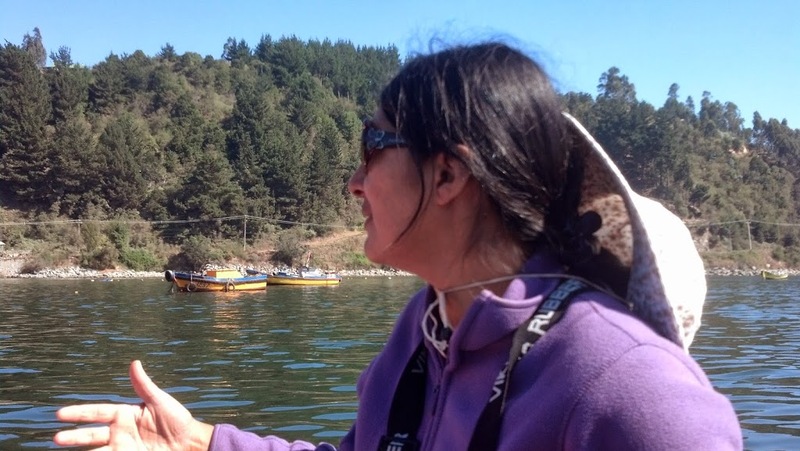 Could Jessica and her mussels be the basis of a game changing initiative for Dichato? It sure seems possible; with more assistance like that provided by the Harvard students, creation of some sort of cooperative organization that includes other fishermen, technical assistance from the University of Concepción and others working on mariculture, and a good dose of good luck, and Jessica may prove to have the nugget of a big deal for Dichato and her neighbors. 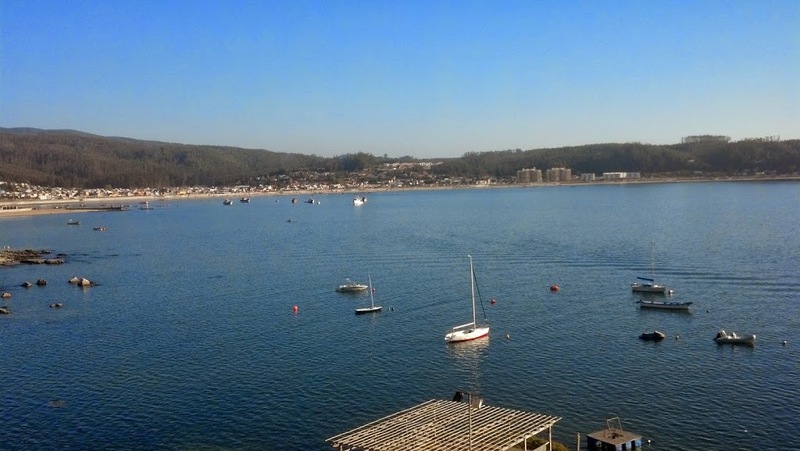 Through the Harvard program, a group of business management students spent time in Chile analyzing Jessica’s situation and they have produced a draft market analysis and related business plan which, if brought to fruition, might provide the impetus and the economic wherewithal to fulfill the vision of Dichato as a vibrant year round seaside destination. Jessica is working on ways not only to get more of her neighbors and colleagues (and hopefully some friendly investors) committed to her project, but she is pursuing ways to establish a shellfish hatchery in the area so she does not have to pay high transport costs for the seed she uses in her farm. Jessica clearly has the required entrepreneurial personality and skills for her project to take off. As we talked with her she kept feeding my Crete-induced vision of the future Dichato with her ideas of producing high quality gourmet seafood products to sell to restaurants and individuals in Dichato and surrounding towns, even in the large city of Concepción, of establishing a seafood museum or exhibit of some sort in the local market (Mall Dichato) to educate visitors on the ocean environment and seafood production, and even boat tours into her mariculture farm to give visitors a firsthand demonstration, including fresh samples, like she did with us during our visit. While we were bobbing up and down in Jessica’s boat, listening to her story and plans, her brother was slowly and meticulously gathering a sack full of mussels from one of the ropes they have lowered below the long-lines. Once on shore, Ned, Ximena and I put the sack of mussels in the trunk of my car, bid farewell to Jessica who was going to return to the long-lines to do some equipment tending, so we headed towards one of the neighboring palafitos (those weird looking houses on stilts) that now houses the restaurant “Tía Paula”. 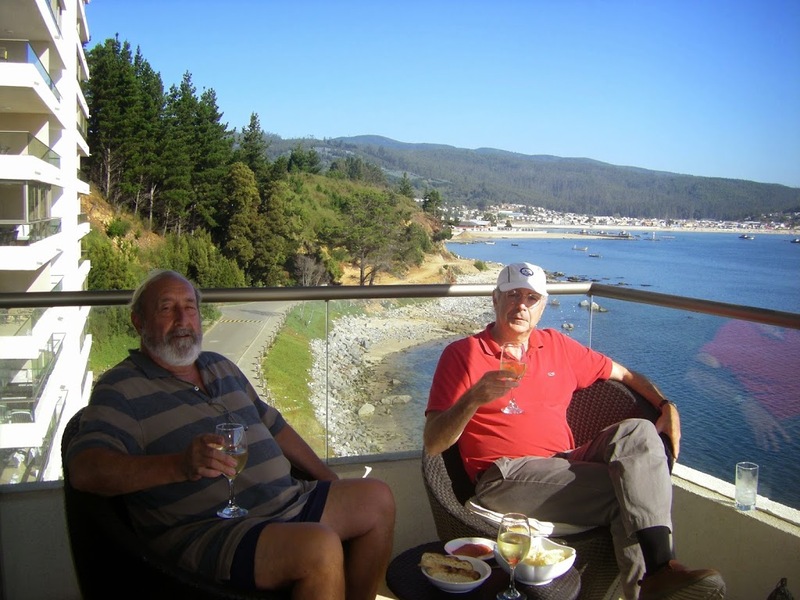 That night, after a wonderful lunch at Don Mino’s and a long nap, we were invited to Martín’s home in the center of Dichato for “onces”, the traditional Chilean afternoon tea. Usually Chilean “onces” is any combination of toasted bread, jams, mashed avocado, scrambled egg, fresh cheese, and tea or coffee. We had given Martín the mussels we received from Jessica, but we were pretty much convinced those mussels would not be served for “onces”, and that since we were leaving the next day, we probably would not get to taste them. Pleasant surprise! As we sat at the table discussing Spanish recipes with Martín’s father-in-law, Don Fructuoso Biel (author of the cook book entitled “El Fogón de Don Fructuoso”, Martín’s wife, Marisol, placed in the middle of the table, a steaming pot of Jessica’s mussels, flavored not only by the cool waters of the Coliumo Bay, but also a mixture of feathered onion, chopped garlic and parsley, and laurel leaf. The tea and coffee cups were quickly carried off to make room for the wine goblets and, well, you know the rest. We had planned our visit to Dichato to coincide with the fourth anniversary of the February 27 event (4:30 AM, more or less), thinking that surely there would be some sort of public community event. There was none. What was scheduled, apparently, was a small religious service in the evening, before the sun went down, on the beach. We were so caught up in the euphoria of Jessica’s mussels, that we forgot we had thought about going to the beach for the service. However, a woman who helps Marisol when she has guests did manage to slip away to the beach, but soon returned to report that “almost no one showed up, so I came back”. So maybe most have decided it is time to look ahead. And we agreed we should do the same. So we ended our visit to Dichato with a toast to Jessica and her mussels, to Pilar’s community development work, to Harvard University’s willingness to accompany Dichato through their tough recovery period, and of course to Martín, Marisol, and Don Fructuoso, who have added so much flavor to our visits to Dichato over the past four years. 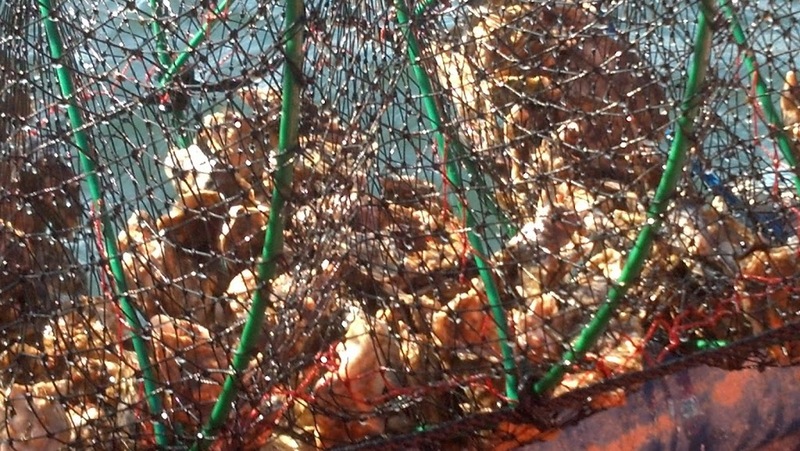 One of the Harvard specialists helping with this project has also drawn a parallel with artisan fisheries dynamics in New England; same problems. Hi Daddy: I enjoyed reading this. I have one question. I seems like one of the reasons so many people were unaware of the tsunami was because of lack of forewarning. 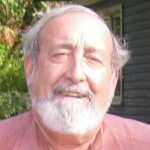 You mention the disorganization and lack of communication in your writing. What has been done to improve this? Is Bachelet also looking into improving the warning system or did Pinera work on this already? Andrea: Check out paras 7-9 (more or less), regarding your question. Yes, a lot has been done. We shall see what Bachelet does to keep the modernization process going forward of all public disaster preparedness, response, and relief institutions. Time will tell. The ball has been dropped before; short memories around here. Thanks for this great account of the trip. We Harvard people greatly appreciate your reflections on the work we and our many friends have done in Dichato. Jessica probably represents one of the most dynamic potential contributors to the region’s economic recovery. The fact that it has taken her so long to sort through the many hurdles is a testament to her patience and character. Now that she is at a point where she can literally develop a new industry for the region, it is very exciting. 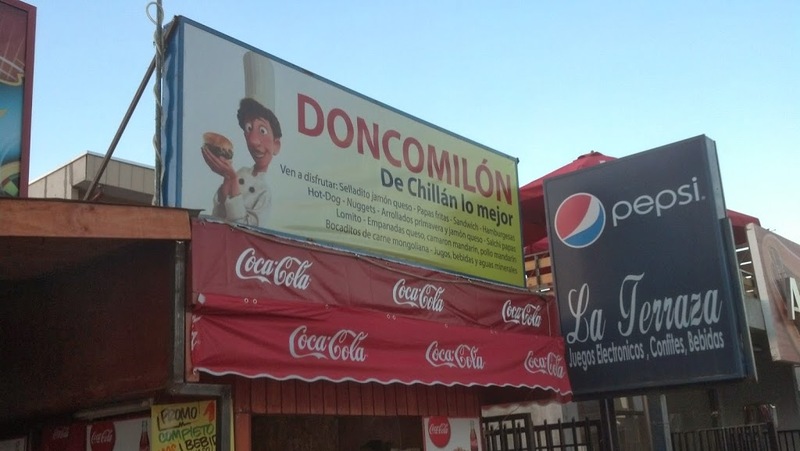 I look forward to more pipeno from Don Mino and longaniza from the market in Chillan. Thank you for the 2014 update on Dichato and its progress. Do you know any more about the urban land use process used there and how local government people made agreements with the national ministries for infrastructure projects? Who made the decisions. There were early protests on the eminent domain decision that allowed for the tsunami buffer project. 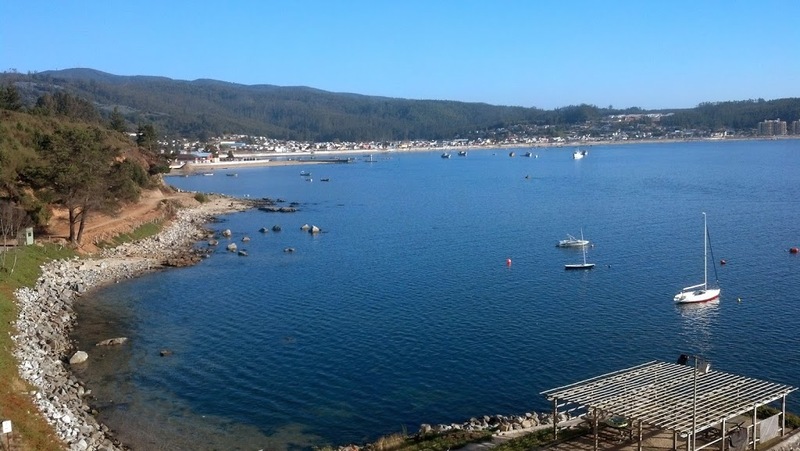 Have you visited Talcahuano in the last few years? I am interested in the recovery process there, as it is a much more complex place for positive recovery outcomes. Good evening, please I require information from jessica cabrera phone or mail, I need to contact her. My email is lizbeth.ravelo@gmail.com from Peru.